A dressing table is an integral aspect of any bedroom furniture. Without this furniture piece, a bedroom looks incomplete. So, a dressing table is an important part of a bedroom or dressing room’s design. It offers the user a simple and practical way to organize a multitude of small things in one place and it keeps all these knick-knacks contained and exactly where they need to be. A dressing table with mirror is even more functional! They are available in wide variety of material types such as wood, wrought iron, moulded plastic, etc. While buying a Luxury dressing table for your room consider various options and compare the price as well as quality they render. This can be easily done with online furniture selling sites. This will give you a fair idea of different types of varieties available in the market. In fact, you can have a look at the huge collection of high end dressing tables at the comfort of your home. 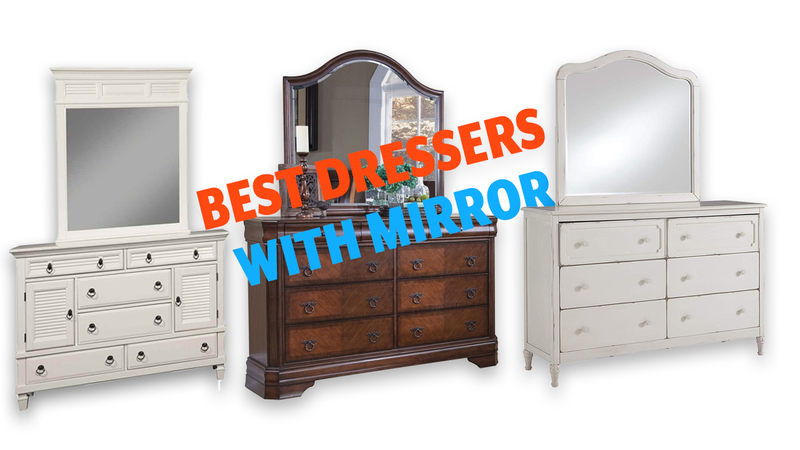 So, it is advisable to buy best quality dressing table online. When we come this word “Luxury” firstly, we think it’s costly. Luxury means costly. But not just for nothing – because there is a brand. It is costly because luxury furniture should be made with the best materials, the best workmanship, and more often than not, with bespoke elements and finishing. A luxury dresser made by good and highly skillful engineering construction. They can go to great lengths to give you the best quality products. Bringing a stylish dressing table will make your room look more appealing and luxurious. If you buy an elegant piece then it’s not necessary that you go for too costly or too large dressing table. If you just need a place to sit and brush your hair then there are many options available. In case you’re wondering what type of design and quality such a piece could have, take a look at the following dressers. The Savona collection offers a luxurious ambience with exquisite detail and refined style. 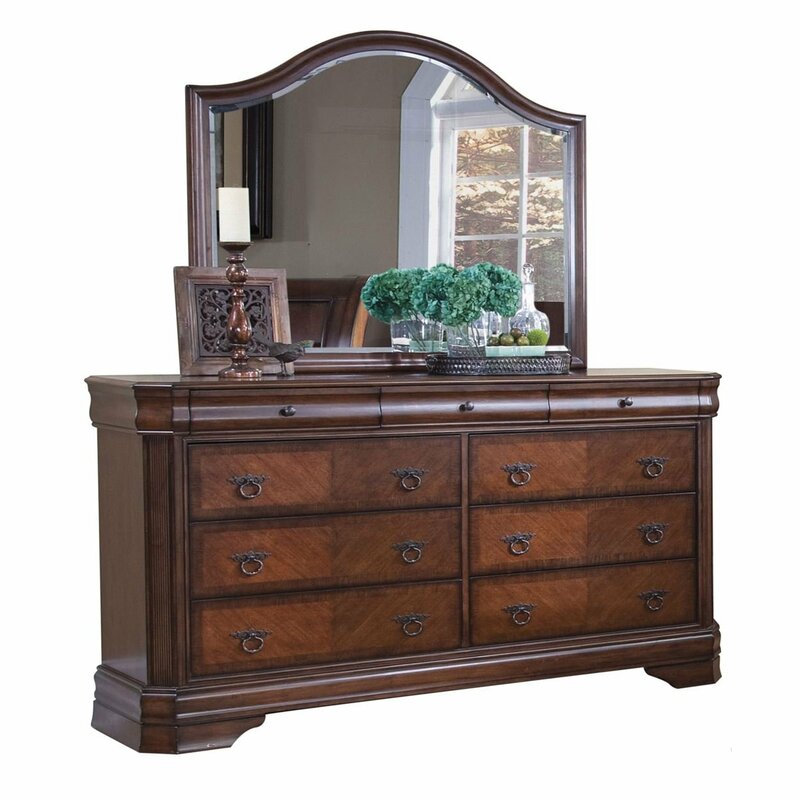 Distinctive style elements include bookmatched veneers framed with contrasting edge banding, inlaid detailing on case tops, reeded pilasters, and antique brass finished hardware, Combining tradition with modern day convenience, Savona offers optional underbed storage and felt lined top drawers in the dresser, chest, and nightstand. This high end dresser has 1 year limited warranty! It’s come with free deliver to your door. Size/Weight: W 68″ / D 19″ / H 39″ / 259 lb. The dresser is too heavy! The Charming farmhouse design lures you into this dresser. 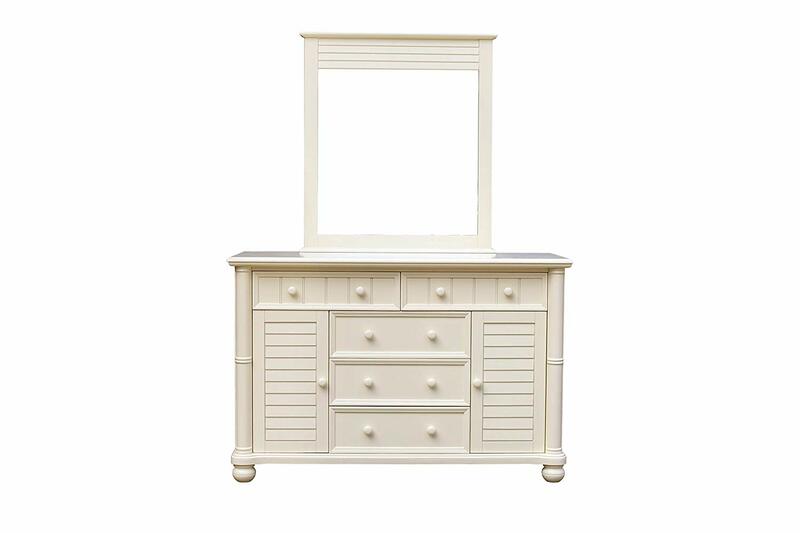 This lovely dresser is chippy white finish exudes an heirloom quality that is befitting for your little princess. The scalloped framed top drawers are lined with felt, keeping her precious belongings safe. A wistful touch consumes her room with the decorative turned legs. Mirror reflects her beauty. This is one the best luxury choice for any girls bedroom! 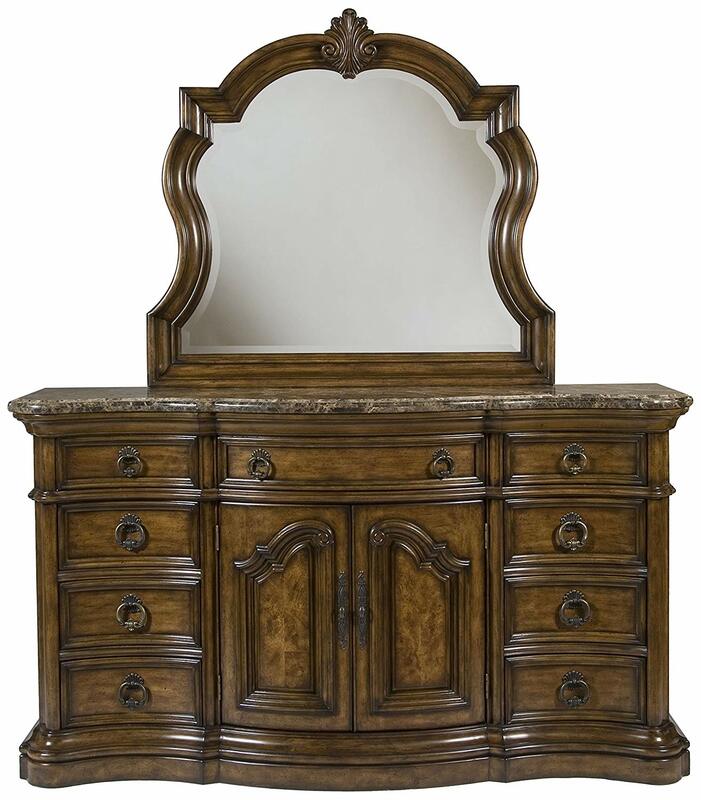 This popular dresser has 1 year limited warranty and comes with free shipping to your door. As one of the country’s best known furniture brands, Pulaski Furniture is synonymous with craftsmanship and refined styling. With a heritage of over 60 years, Pulaski Furniture has been furnishing homes across America with the complete design spectrum: traditional, contemporary and transitional furnishings. The dresser offers plenty of storage with nine drawers and three tray drawers behind two doors. The laminate marble top adds a mix of materials and touch of luxury. This high quality dresser very is beautiful, gorgious, and lots of space to add anything inside of it. The dresser felt bottoms in top drawers and Antique brass finished hardware. The Antique Brass finish is raw brass or brass plating which has been chemically darkened to simulate aged brass. Antique Brass finish is typically a medium brown with golden undertones, and can vary significantly from one product to another. In additional you will get a beautifull laminating marble top on this dresser. The marble Laminates is a type of popular surfacing material made from layers of Kraft-paper glued together under high pressure and temperatures. It’s makes this dresser more attractive looks and study. However, the San Mateo collection is always embraces a relaxed sense of elegance. This popular dresser feature soft lowing shapes with a rich finish. This dresser offer you more additional features and benefits. The construction of this high end dresser is dovetail interlocking construction on front and back panels create top quality, sturdy drawers that withstand everyday. You can use bottom drawer panels secured by corner. The blocksdresser back is flush, recessed, fitted and screwed. Thick glass beveled with an angled edge cut around the entire mirror adds classy ‘ glassy’. The charmmirror is flush in back and can be hung separately (wall hanging hardware not included). It’s Constructed from solid wood veneers over durable medium density fiberboard wood (MDF) for stability of large surface areas. Unlike solid wood, these durable wood products are non-absorbent, assuring your furniture will not warp or crack Hand rubbed 8 step finishing process. The double-sealed with safe, water-based lacquer for a velvety finish protected from scratches and stainsdresser. 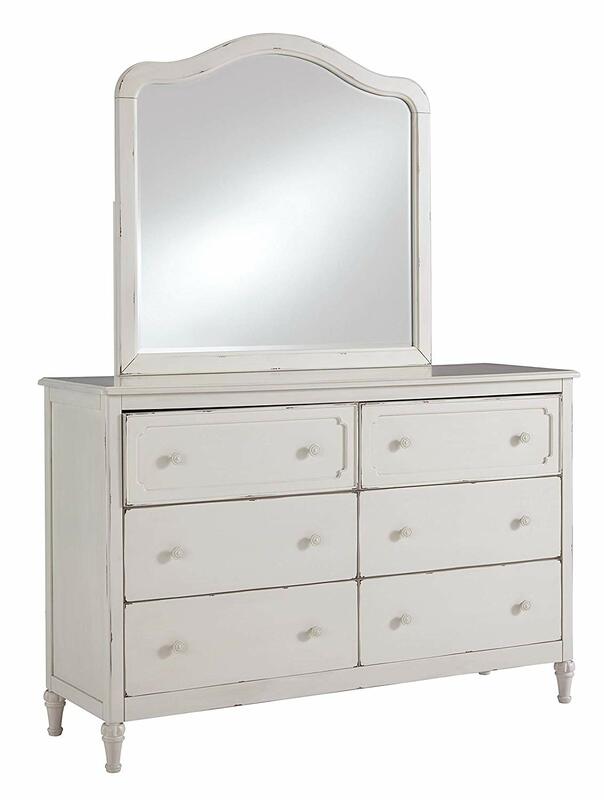 This beautiful dresser has 2 year limited warranty. This dresser warranted to be free from defects in workmanship and materials for a period of 2 years from the date of original purchase.